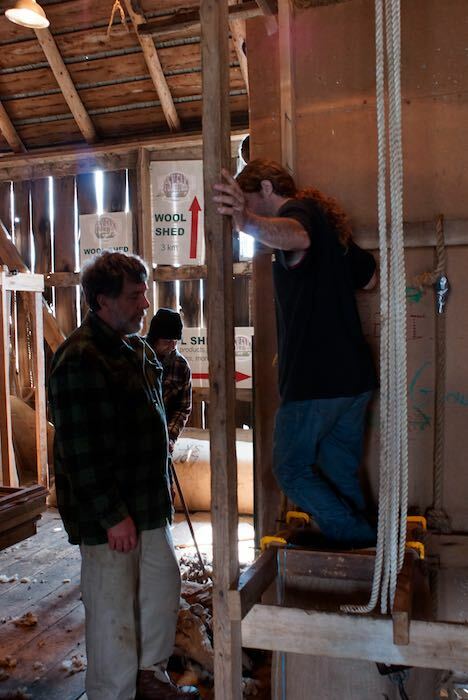 Last week I took my boys to Topsy Farms on Amherst Island, Ontario (a short ferry ride from Millhaven, between Prince Edward County and Kingston) to see the sheep shearing. I have known the daughter of one of the farmers since we worked together for the first time at a cafe in Kingston during homecoming weekend of my old alma mater, Queen’s University, in 1993. When I started knitting again, back in late 2008, I made my first ever hat from their wool. 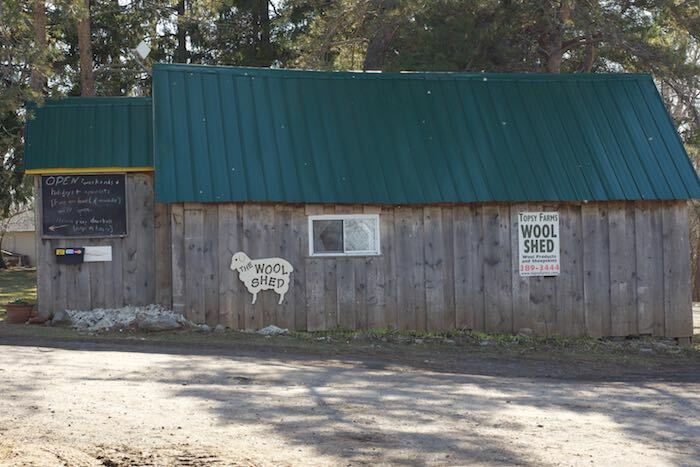 I currently use their natural (undyed) wool yarn and roving for my Sheepy Dryer Balls and their (perfectly suited for needle felting) roving for my needle felted ornaments and catnip balls. 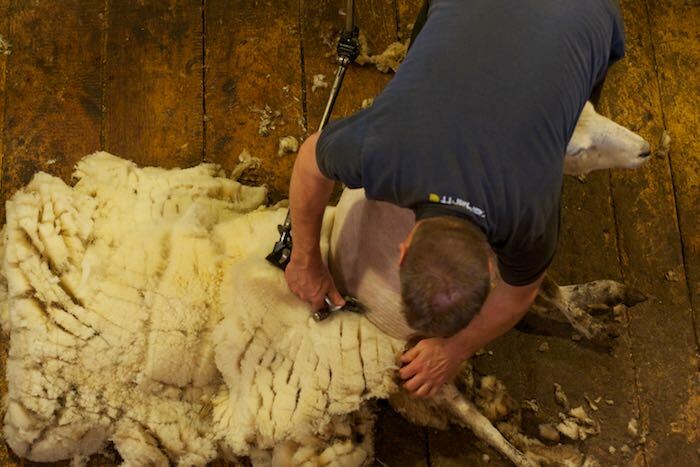 I’ve been to the farm many times over the years, worked in the Wool Shed some afternoons, been on some sheep drives, visited during lambing to feed the foster lambs, and done a few needle felting workshops there as well, but I have never made it to sheep shearing. 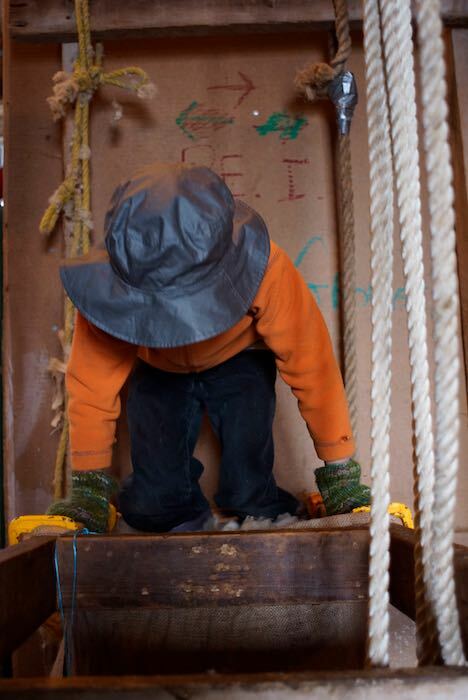 I figured the boys were old enough to behave themselves and even help a little if possible. I just wanted to take photographs and see the process (although I have been recruited to help in my own little way next year. 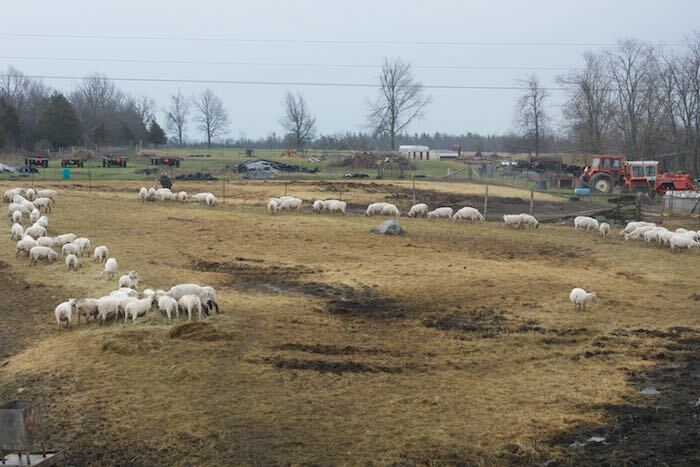 I fed 2 of the roustabouts – my friend and her husband with whom we stay when we go to Amherst Island. Next year I will feed all of the helpers). This is a little (er, actually make that a LONG) bit of photojournalism for you. 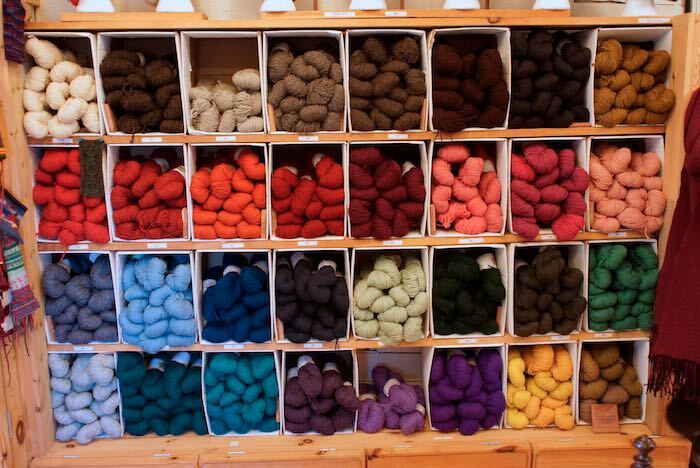 I’ve always been curious about the whole process (being a knitter), and maybe you have, too. 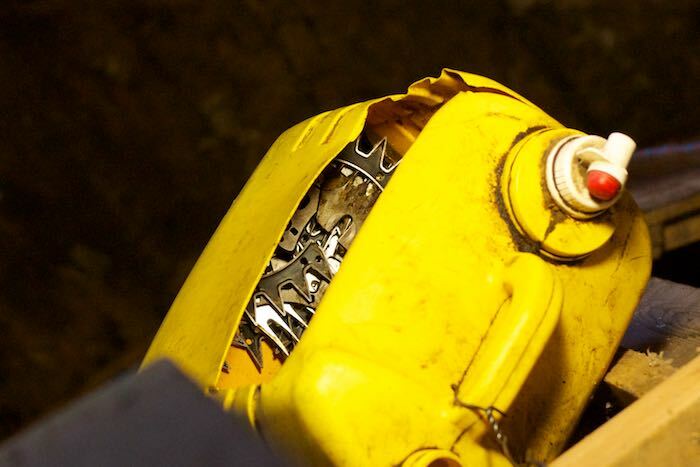 This post is meant to take the mystery out of the process. 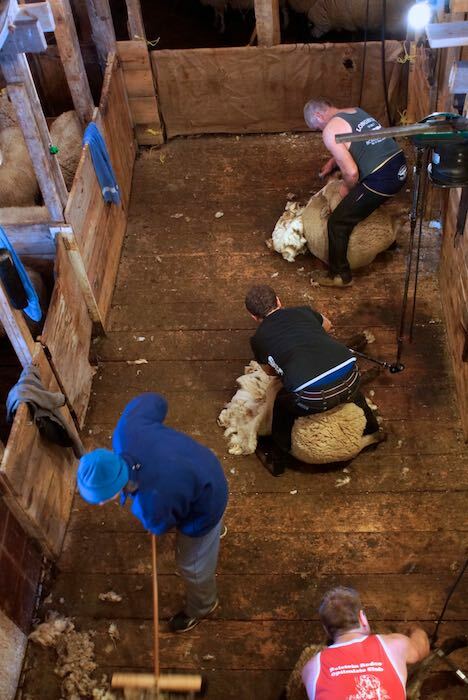 Basically, there’s the skirting table in front (with 3 roustabouts working around it), you see the stairs up to the observation area behind , straight down to the left is the shearing area, and on the left out of the photos behind the wood panels is the second last waiting area for the sheep. 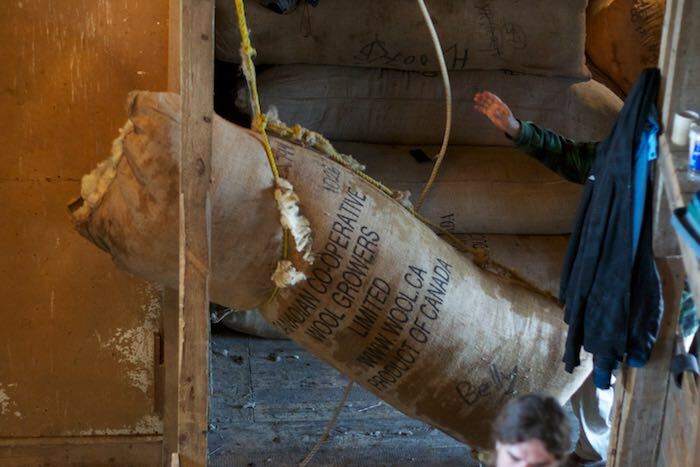 To my right (from where I took the photo) is where the huge wool bale bags hang. 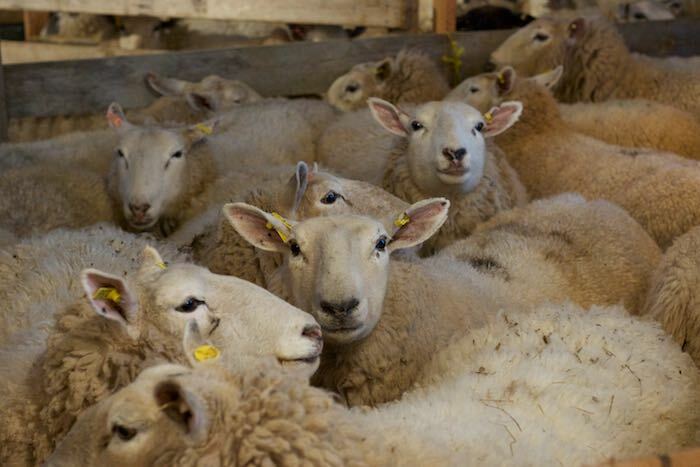 The first step for the sheep is waiting. 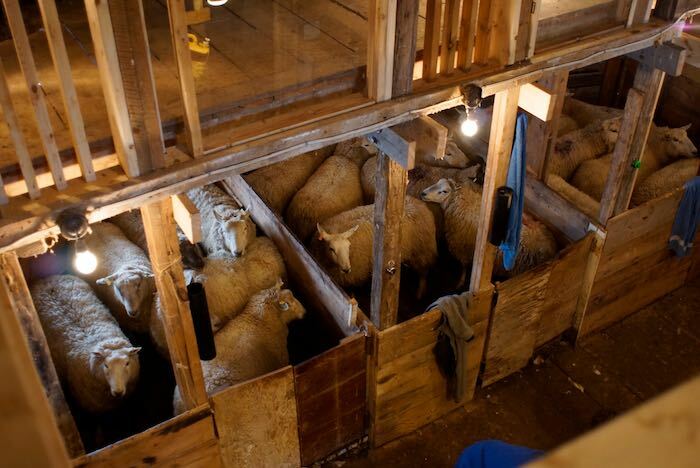 They wait in big pens downstairs, and are encouraged along up the ramp and into big pens upstairs and eventually into 3 little pens with swinging doors, 1 for each of the 3 shearers. 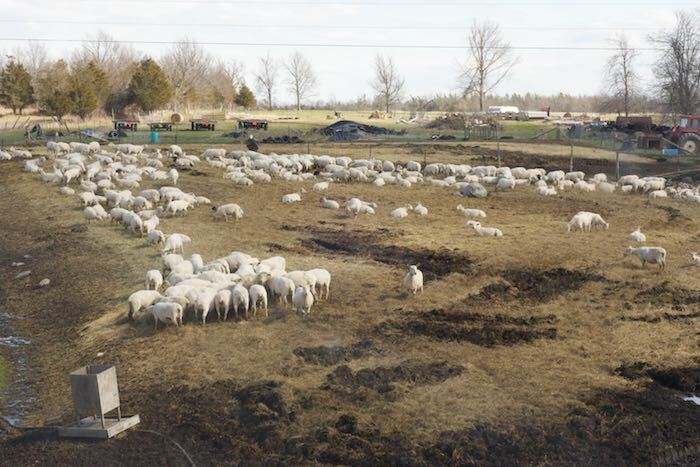 So there is a roustabout who keeps the sheep in supply. 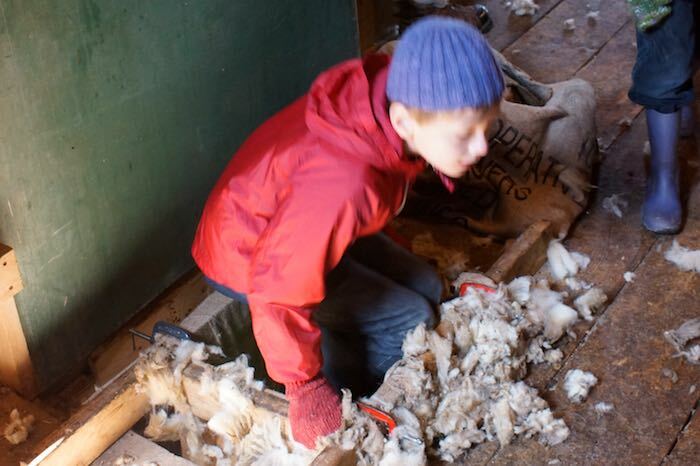 At the end of the shearing, a roustabout stands by picking up the fleece (which comes off, miraculously, in one piece!) in a certain way. The swinging door leads to a ramp outside. 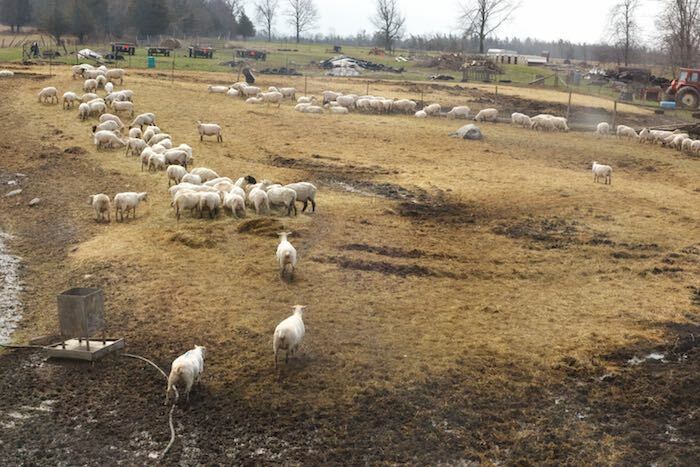 Sheep don’t like to get their hooves wet, so these sheep (and the rest) are a little dubious about jumping off the platform into the muck. But eventually they go for it and join the others on the grass. 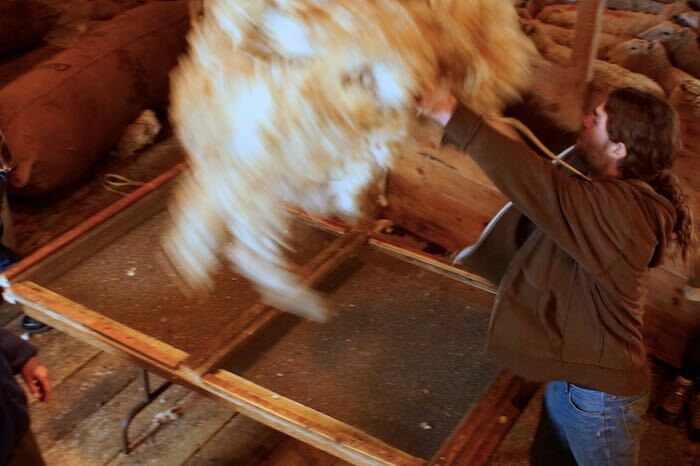 Then the fleece gets rolled up and put into the big bale bag clamped behind them. 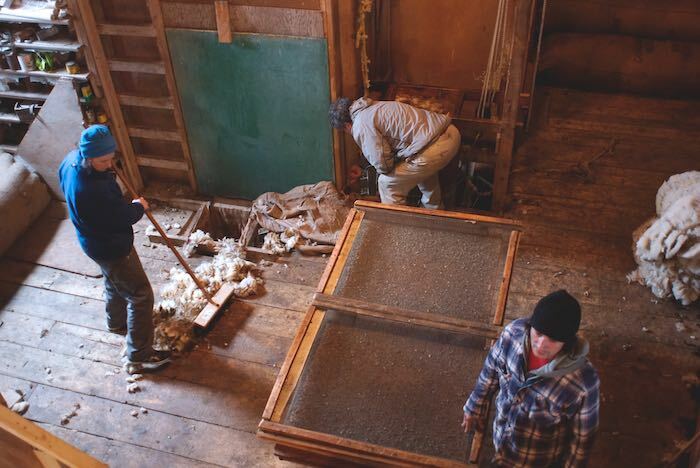 There is another bale bag clamped to the left on the floor where the dirty wool gets swept. 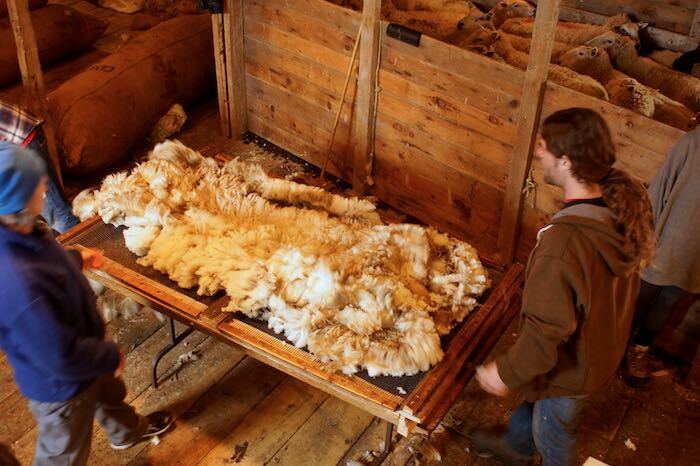 That wool is separated and used for things like rugs or things that will not be next to the skin (clean wool is used for blankets and yarn). Speaking of sweeping, it is a big part of the roustabout’s work. 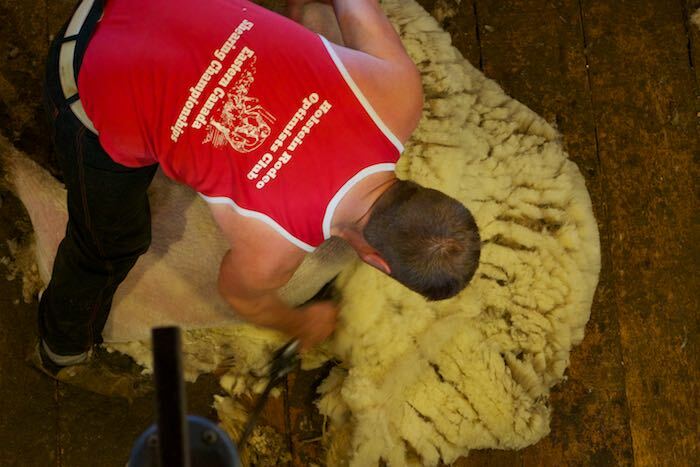 Keeping the area clear of wool for the shearers and for the roustabouts as well. 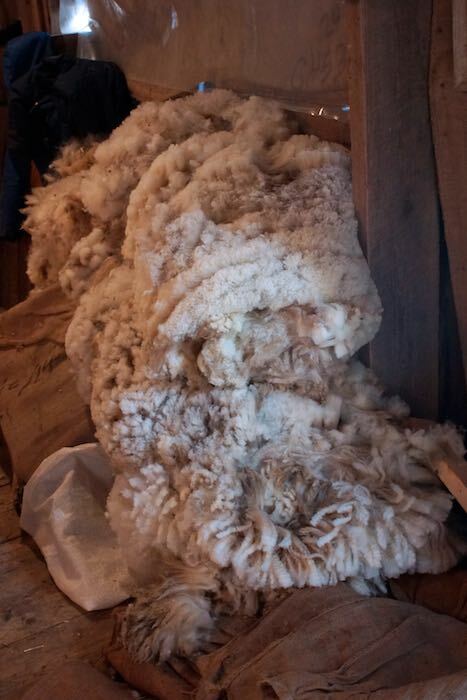 Nicer fleeces get selected out and put in a pile for customers who are buying full fleeces to choose from. Once the bale bags get a bit full, they are packed down using “foot power”. This is where my boys come in. They are not really heavy enough to do the work at the end, which is done by bigger people. When the bale bag is full, it is unclamped and pulled up and moved using pulleys (the bale bags are huge and very heavy). They are closed (and repaired when needed) using thick plastic twine and a huge needle. 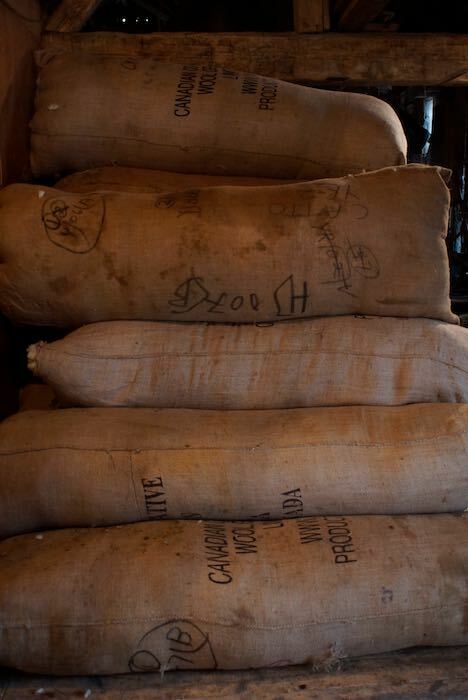 Here is a pile of the wool bale bags. 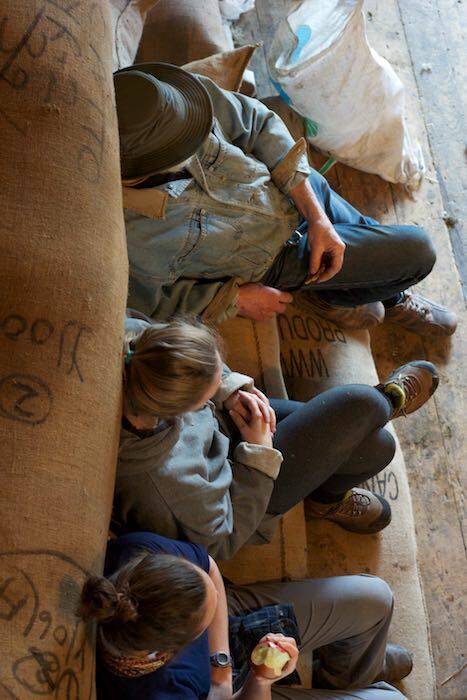 And to give you an idea of their size, here’s a couple of rousties and farmer Ian taking a break on those same bags at afternoon break. And that about all there is to it. 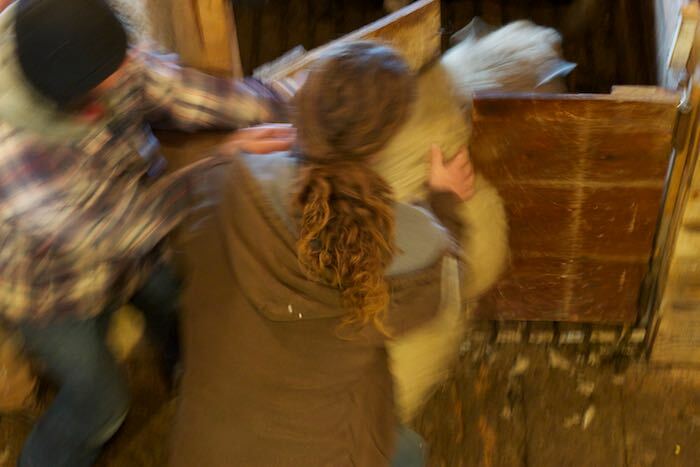 Except that sometimes there’s a little excitement when one of the sheep actually shoves its way out of the swinging door into the shearing area. 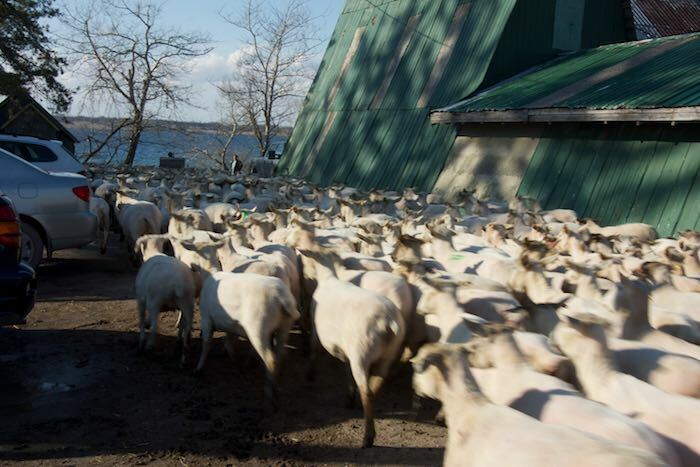 You hear the hoofs right away so the roustabouts know to get there quick and get it back in the pen away from the shearing. 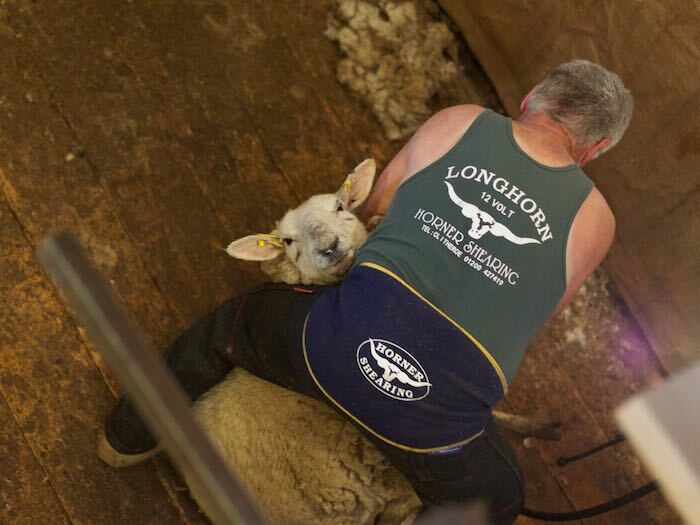 And a little detail about the shearing: they change the blade that moves across on the shearing tool every 15 minutes, and the other blade once an hour (and spend the evenings sharpening). 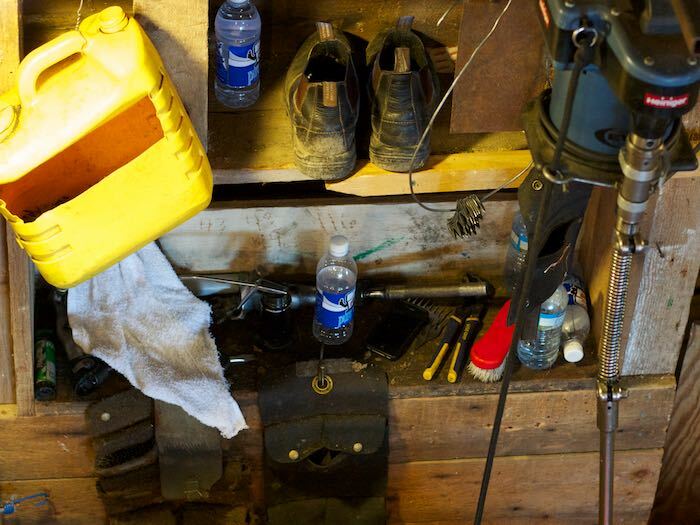 Here’s a bin full of used blades. 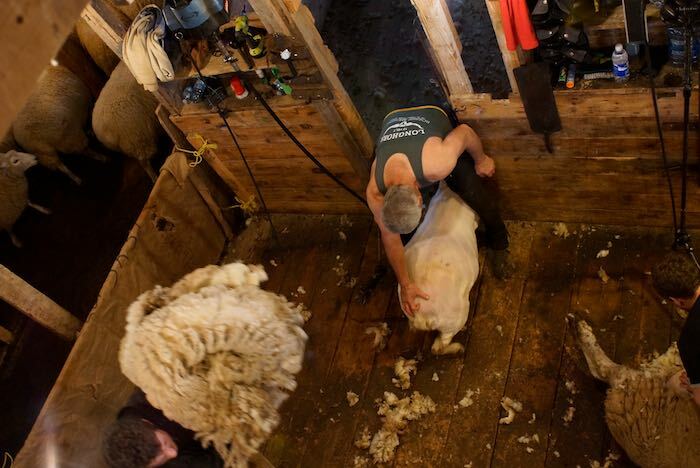 And here is the shearing station. Everything in its place and a place for everything. They need to be able to know where everything is to keep the flow of sheep going. 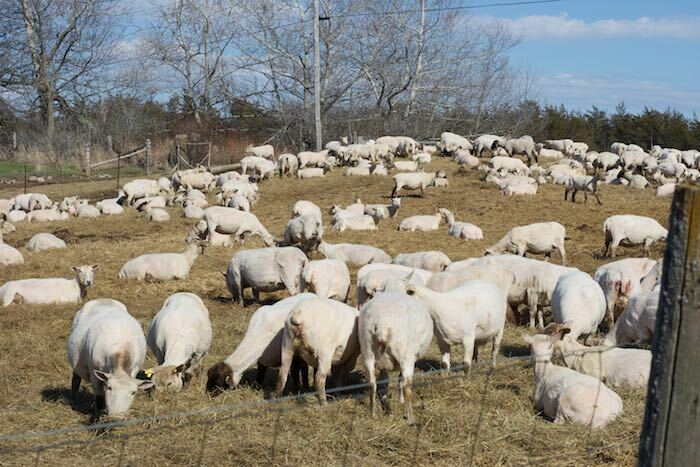 Here’s a glimpse at how many sheep were shorn on day 2. This photo was taken a morning break (10:25am). And this photo was taken near the end of the day at around 4:10pm. 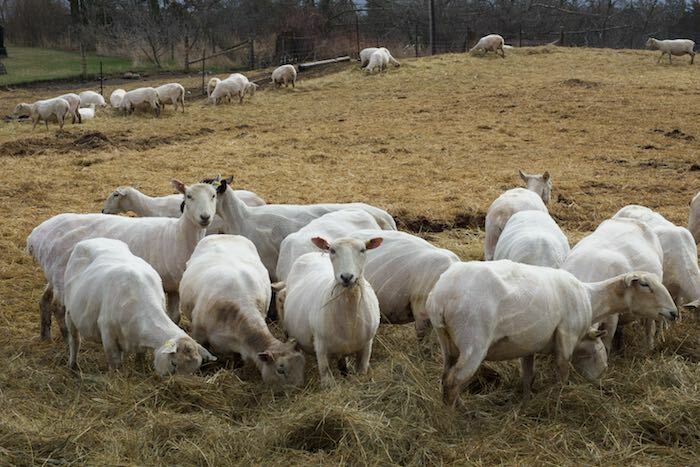 Remember that photo at the beginning of the day of the shorn sheep greeting us? This is the same shot at end of day. 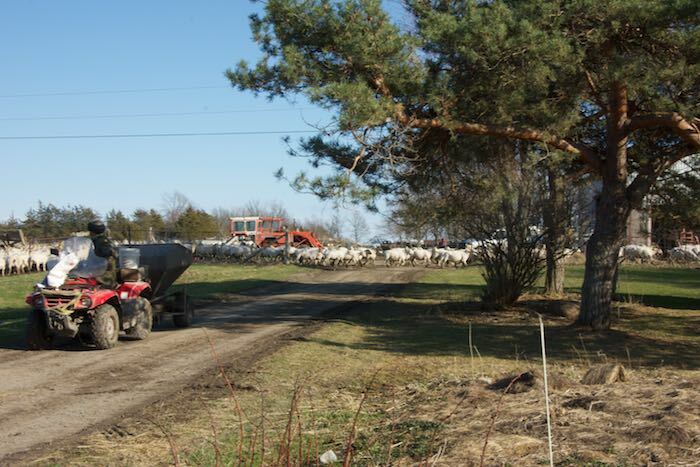 The last thing to do is a sheep drive to get the sheep back to the fields where they have space and food. They were going to try to get them out through this muck (in the foreground of the photo below), but it didn’t work out (as I said, sheep hate getting their feet wet). 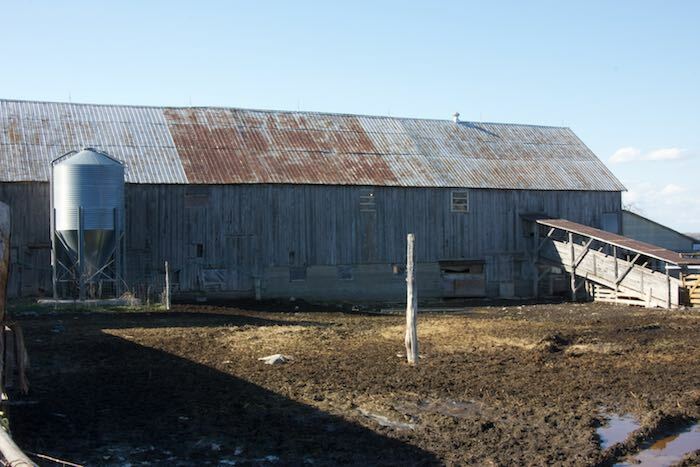 The photo below also shows the barn where the action was, and the ramp where the sheep exit the barn. 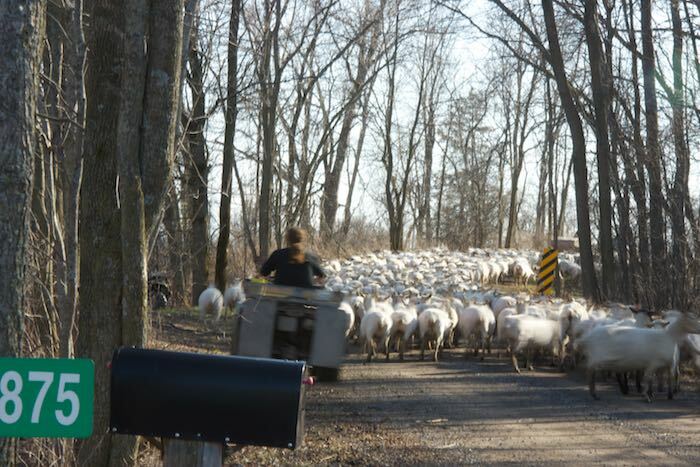 So instead of leading the sheep out of the gate above (shown in the very bottom left of the photo above), they let them out in a drier spot higher up, but there was no strategically placed person to direct them around the corner and down the driveway, they were just supposed to follow the ATV with a feeder attached (they are familiar with the sound of that particular machine and usually follow it around the fields, knowing that it’s feeding time) but they went straight instead. A little chaos ensued. I was there to take photos but ended up chasing them off the lawn and the neighbouring lawn. Here they are on track, going down the driveway. And now they are in the care of several farmers on ATVs, heading to their field. 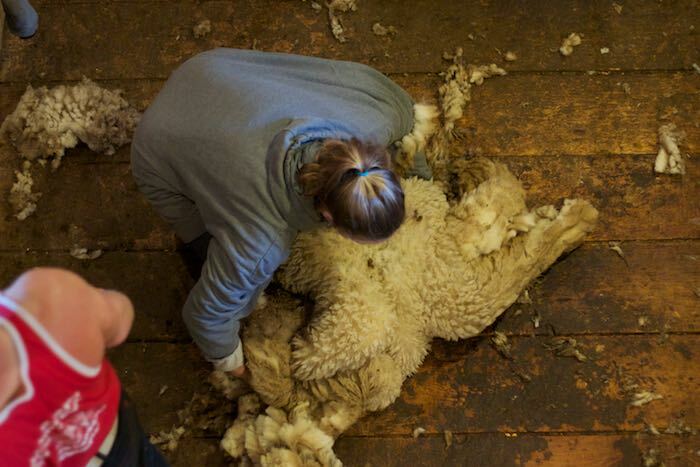 This time-lapse video I took on my phone shows shearing in a nutshell. 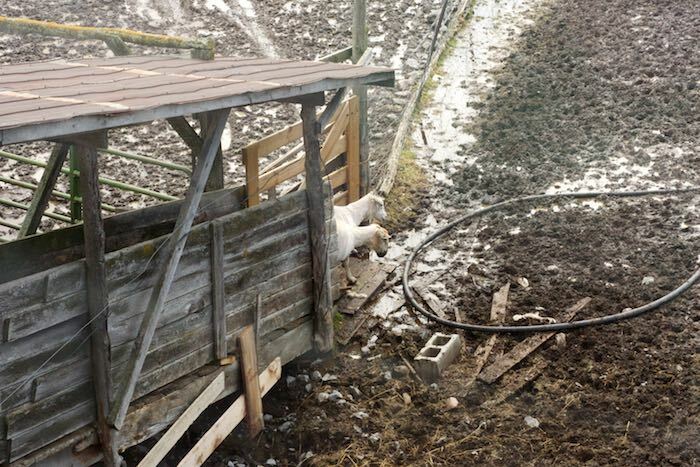 At the end of the video, the roustie takes a blue stick thing and marks the sheep with it. 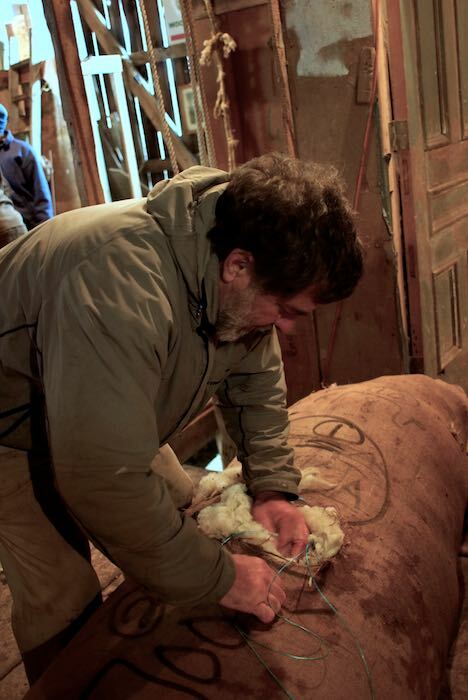 That’s a male lamb and it’s being marked so that it can be removed from the flock (rams are put in with the flock only at breeding time in the late fall). 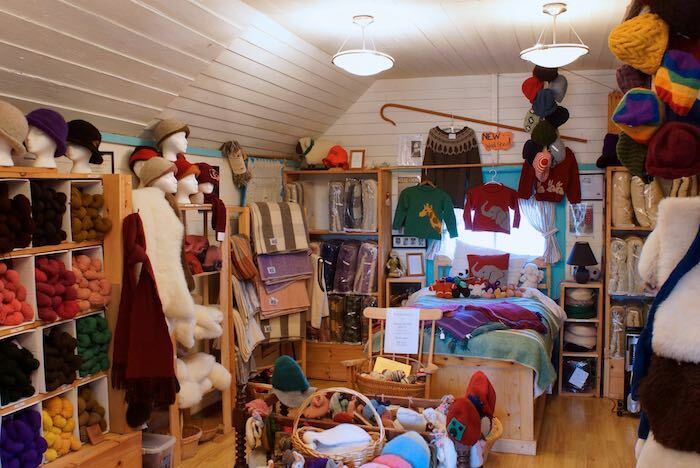 All of Topsy Farms products can be bought online or in their shop, the Wool Shed, shown below. Wow – amazing! Thanks for sharing. I really enjoyed it – and had no idea. 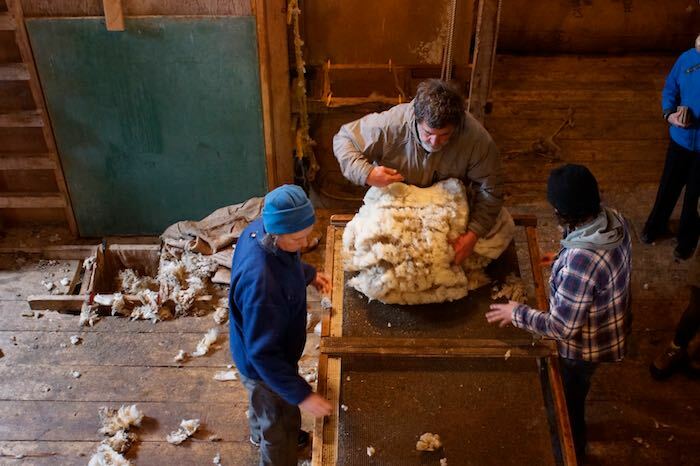 Especially surprised that the wool comes off in one piece! I knew that before but it’s something to see! I’m so glad I got to hang out and see the whole process. Great post! I loved all the pics and descriptions. Thanks so much for sharing! My pleasure! I’ve been curious about it for so long that I felt like I should really share all of the details so the reader could know as much as possible! Glad you liked it. What an informational post! Good work. I love Topsy Farm and Sally!